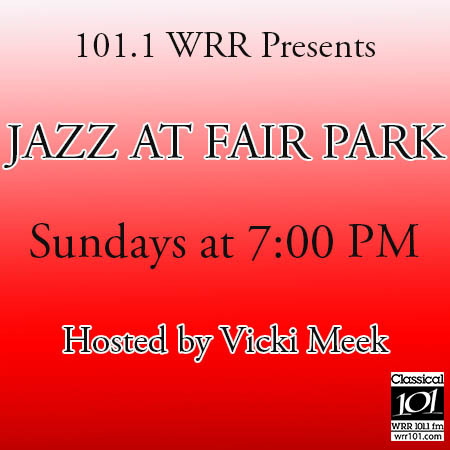 Jazz at Fair Park is a new, weekly program produced by WRR-FM (101.1), Dallas’ station for classical music and the arts. Produced and broadcast from the historic WRR studios in Fair Park, the program airs Sunday evening from 7 to 8 pm. Jazz at Fair Park can be heard throughout north Texas at 101.1 FM, or worldwide via WRR’s web stream at wrr101.com. The show is hosted by DFW-area arts and cultural expert and jazz aficionado Vicki Meek and features interviews, music and (approximately every fourth broadcast) “live” performances by jazz musicians of note from the local area, Texas and around the world. At WRR, we cherish jazz as a great American form of chamber music. It is an important musical genre that has influenced generations of classical composers and performers just as jazz composers and performers have been influenced by classical music. It is also a part of the fabric of American life and is closely interwoven with Broadway, television, film and most forms of popular music. Each month, Jazz at Fair Park will feature a particular jazz style or period in history influenced by jazz music and musicians. This is the first full-length jazz program produced by WRR and one of the few available anywhere in the nation. Jazz at Fair Park is a reflection of the station’s commitment to bringing great music and art to all residents of our North Texas listening area.